Graduate students in the theology program recently returned from a pilgrimage to Rome. 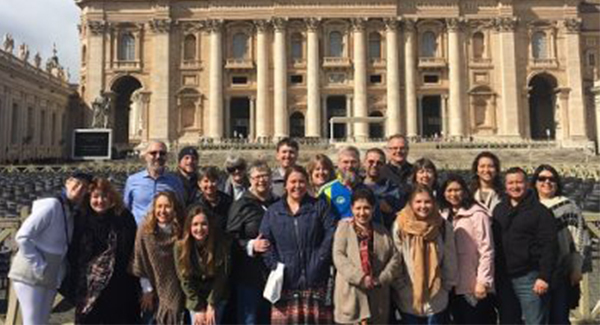 During spring break, Dean of Graduate Studies Father Joseph Gile and University Chaplain Father John Fogliasso embarked on a pilgrimage to Rome along with 20 graduate students. These individuals are students of the Newman theology master’s program who participated in the pilgrimage as a culmination of their two-year study. Gile teaches the Newman elective, “Christian Rome,” and was in charge of offering the Masses and liturgies throughout the pilgrimage. Gile said that, having lived in Rome for four years, his personal experience helps with the planning process for the trips overseas. One goal of the pilgrimage was to allow the students the opportunity to “experience what it is they have been studying throughout the program,” Fogliasso said. “On our first day, we went straight to Assisi and got to experience the beauty of that town,” Fogliasso said. “We saw the Basilica of St. Francis and the Basilica of St. Claire, and we finished with a beautiful luncheon at a vineyard outside of Assisi. Then we returned to Rome where we experienced the different Roman churches and culture. 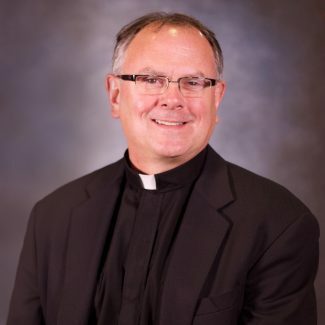 “Father Gile invited me to be the main celebrant for Mass at the Vatican, so that was a unique privilege and experience to offer Mass as well as to enjoy the Scavi Tour,” Fogliasso added. According to “The Catholic Traveler,” the Vatican Scavi Tour goes through the excavations below St. Peter’s Basilica and is considered one of the most exclusive tours in Rome. Compared to the tens of thousands of people who visit the Vatican each day, the tour is limited to only 250 tickets per day. Every Wednesday, Pope Francis invites a general audience to visit St. Peter’s Square. During this time, pilgrims and visitors are given the chance to receive the Papal Blessing, Gile said. Every student was allowed to bring one person with them for the pilgrimage to Rome. In addition to his wife, one man in the program asked to bring his four kids, who are in their 20s. His request was granted, and the whole family tagged along for the experience. “It was a family vacation that they will never forget,” Gile said. While the pilgrimage to Rome has been a tradition for nine years, Gile said that when Assistant Professor of Theology Matthew Umbarger, Ph.D., came on board, the class decided to shake things up and travel to Israel. Last year’s pilgrimage was the first time a group from Newman visited Israel — and due to its success, they have decided to alternate pilgrimages between Israel and Rome in the years to come, Gile said.